(Family Features) Summer typically brings about both the desire to feel healthier and cravings for sweet, refreshing meals. When you rethink your food and focus on feeling better about your diet and yourself, the two can work hand-in-hand. For more summertime recipe ideas, visit Truvia.com. In small bowl, add coffee, brown sugar blend, black pepper, coriander, oregano and salt; mix well. 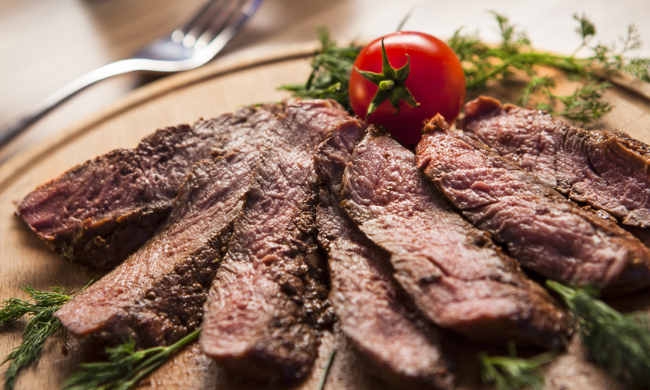 Place London broil on cutting board or large plate. Drizzle 1/2 teaspoon of olive oil on each side of meat then rub all over. Sprinkle seasoning mixture over roast and rub in to evenly cover meat. Grill London broil to desired doneness, about 3-5 minutes per side for medium rare. Tent meat with foil for 5 minutes then slice into thin slices, cutting at an angle against the grain. In medium mixing bowl, stir together berries, 1 1/2 tablespoons natural sweetener and 2 tablespoons flour until well combined. Spoon mixed berries evenly (about 3/4 cup in each) among six ramekins (4 1/2 inches in diameter; 1-1 1/2 cups capacity). Place ramekins on baking sheet large enough to hold them in single layer so they sit flat. Add remaining flour, protein powder, remaining natural sweetener, cinnamon and vegan butter to small mixing bowl. Using fork or pastry blender, stir flour mixture together to create crumble. Divide crumble evenly over top of fruit in ramekins (about 1 1/2 tablespoons per ramekin). Bake until crumble is golden on top and berries are hot throughout, about 14-20 minutes. Let crumbles cool 3 minutes. Top each with 1/4 cup ice cream for serving. Cover any remaining crumbles with plastic wrap and store in refrigerator up to 3 days. Reheat in oven then top with ice cream just before serving.